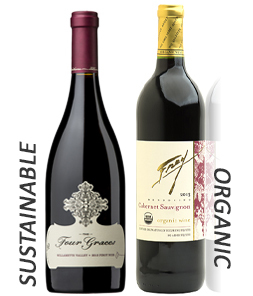 Home > NEW Eco-Friendly Wine section added to Peterson stores! NEW Eco-Friendly Wine section added to Peterson stores! Quivira specializes in small-lot wines from varietals specifically matched to the soils, seasonal strength of sun, and coastal influenced nights that accentuate the unique characteristics that flow from the vine directly to the wine. Known for their high-quality Zinfandel, the Quivira Zinfandel is loaded with big, deep, dark berry aromas. There's a brambly mix of raspberries and black cherries in the 2012 balanced by pepper, earthy tannins and enough acidity to keep things interesting. The practice of biodynamics is nothing new in Europe. 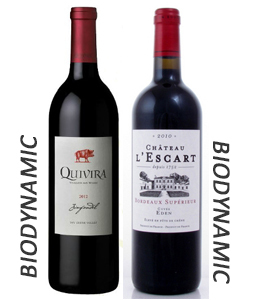 It's a successful method that has been used for the last 8,000+ years and for Chateau L'Escart the practice of biodynamics isn't a second thought. Château L'Escart is a truly remarkable Bordeaux. Being a Merlot, Cabernet Sauvignon and Cabernet Franc blend, this red shows luscious fruits with a touch of toasty oak, richness and complexity. From biodynamically grown fruit, it has a concentrated character as well as a more extracted and dry finish that will only get better with age. In order to promote a thriving sustainable atmosphere at Four Graces Winery, strong practices are in place such as setting aside 50% of acreage to promote wildlife habitat and utilizing a biodiesel fuel blend in all farm equipment. These extreme measures to protect the land and grapes make all the difference in Four Graces high-quality pinot noirs. The Willamette Four Graces offers aromas of black pepper, cardamom and lilac bringing all of this onto the palate with the added fruit flavors of wild strawberry and red currant. The fine tannins and piquant acids finish with the earthy, chocolate notes that are true year in and year out in this Willamette Valley bottling. Frey Vineyards is one of the leading producers of Organic, Biodynamic and "Sulfite-free" wine in California. Making wine since 1960 in this very same fashion, Frey has set the bar high for others in wine country wishing to follow the same methods. Frey Cabernet is a blend of grapes from inland Mendocino County, the Frey Cabernet is rich and earthy with flavors of plum and a spicy finish. 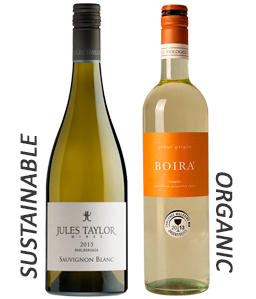 This sustainable sauvignon blanc captures the true essence of Marlborough. Aromas leap out of the glass in an explosion of passionfruit, grapefruit, white fleshed nectarines and notes of nettle and jalapeño pepper. The palate shows concentrated flavours of citrus, passionfruit and lemon grass. It has a nice texture with a firm backbone of juicy acidity. This wine is made from certified organically farmed vineyards surrounding Verona, Italy. The vineyards are rich in limestone, which gives this wine bright aromatics of peach and stresses very intensive acacias with a balanced and elegant alcohol content and a refreshing palate.